Attempts by the coalition government to reach an agreement with the UK's biggest banks on the amount they lend to small businesses have stalled, the BBC has learnt. The plan, known as Project Merlin, was expected to have resulted in an announcement this week, but negotiations will now continue. About £200bn in loans to firms was to have been made available in 2011. The stumbling block is thought to have concerned governance issues. Bank bosses argue that lending targets for what might be weaker businesses could breach rules that say any decision should be in the best interest of shareholders. They also say the banks' ability to lend to companies and consumers may be restricted if some of the ideas from the Independent Commission on Banking (ICB) set up by the government are implemented. Ed Balls, the shadow chancellor, said: "At this critical time for our economy and for the prospects of a strong recovery, the banks should be playing their part in supporting small and medium-sized businesses." He accused the government of going easy on the banks. "This is typical of a Conservative Party which has not been on the case with the banks since it took office and opposed tougher regulation throughout the last decade before the global financial hit." BBC business editor Robert Peston said it was "all a bit odd, since you'd think RBS, Barclays, HSBC and Lloyds would all be desperate to show that they're doing their bit to support small businesses and economic recovery - and take some of the sting out of the widespread criticism of the substantial bonuses they are set to pay". The government has been negotiating with the banks for a number of weeks over the level of bonuses they intend to pay out this year, and over lending targets. Observers suggest the government is prepared to go easy on the banks regarding bonus payments, if they agree to step up lending, particularly to small and medium-sized businesses. As it looks as if the banks are paying little attention to calls for restraint on bonuses, a failure to agree on increased lending targets could be an embarrassment for the coalition, they suggest. However, bank bosses appear to to think that, in the end, a deal is more likely than not, according to our correspondent. Meanwhile, shares in most UK bank fell on Monday following a speech by ICB chairman Sir John Vickers over the weekend. Speaking to the London Business School on Saturday, he suggested that the UK's biggest banks may have to raise more capital - their buffer against losses on loans and investments - than is currently envisaged by the international banking committee in Basel. Lloyds Banking Group was hardest hit, falling nearly 3.4% in Monday trading. Sir John' comments suggested that capital requirements may be particularly tough for traditional retail banking operations - something that affects Lloyds more than its rivals. Raising the additional capital is likely to entail less profits being left over for shareholders, as well as less - and more expensive - new lending, and lower remuneration for bankers. The chairman also suggested that his commission may be gravitating towards some kind of separation of investment and retail banking activities. Sir John said the failure of banks to efficiently manage risks had been "spectacular" and wide-ranging reform was needed but stressed that no final decisions had yet been made. The ICB is looking at financial stability and competition, including the question of what should be done about banks deemed "too big to fail". 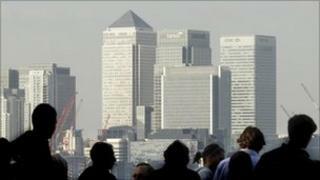 It is also considering issues like whether too few big banks have too much control over the retail banking sector in the UK.